← Are Repeated Concussions Killing Football Players? 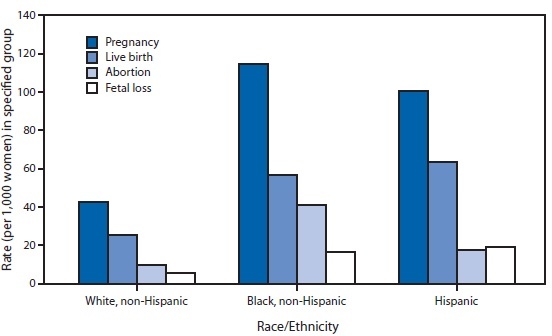 In other words, both black and Hispanic teens are more than twice as likely to become pregnant as their white cohorts. Strikingly, the abortion rate among black teens (41.1 per 1,000) is almost equal to the pregnancy rate among white teens. These numbers are tragic for at least two major reasons. First, regardless of your opinion on abortion, it is sad that so many women are faced with a life-changing decision at such a young age. Second, many of these young women will go on to become single mothers. The poverty rate for single mother households is 30.9%, compared to only 6.3% for married households. (See U.S. Census Bureau spreadsheet.) Poverty, of course, is linked to many undesirable outcomes, such as poor health and crime. It’s a vicious cycle in which poverty begets more poverty. Therefore, any discussion about how to close the enormous racial wealth gap in America must address the large discrepancy in teenage pregnancy rates between the races. Source: Centers for Disease Control and Prevention. “QuickStats: Rates of Pregnancies and Pregnancy Outcomes Among Teens Aged 15–19 Years, by Race/Ethnicity — United States, 2009.” MMWR 62 (48): 989.